Two hidden messages have been discovered which could reveal information about Borderlands 3’s story. Morse code hidden within the game’s new dedicated Twitch channel was discovered last week, and seems to pose two important questions. The new Borderlands Twitch channel was set up last week, and so far has broadcast a pair of Borderlands 2 streams from streamer Mitsu. When the stream is offline, it shows the religiously-motivated guns and roses image from the Borderlands 3 cover art – but there’s a key difference between this version of that image and the ones we’ve seen before. Morse code can be seen running vertically down the screen on either side of the central figure. First spotted by YouTuber Joltzdude139 (whose video on the matter you can check out below), when translated, those codes pose two questions: “Where is the first vault hunter?’ and ‘Who is the Destroyer?’. The first of those is pretty tricky, so before I tackle that one, I’m going to take a brief run at the second question that the image poses. If you recall the original Borderlands, you’ll remember that the Destroyer was the game’s final boss. It was something of an eldritch horror, a giant central eye surrounded by a mass of tentacles. To be quite honest, I’ve put much of that final fight out of my mind, but a quick recap will tell you that the Destroyer was imprisoned in the Vault by former civilization the Eridians, thousands of years before the events of the first game. 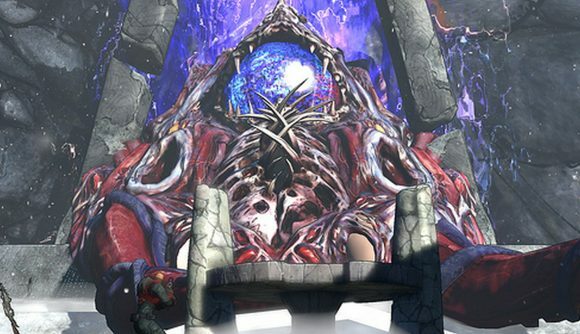 Plenty of people help you access and eventually kill the Destroyer in Borderlands 1, but the question of who the final boss actually is would appear to suggest that the monster isn’t just the Lovecraftian monstrosity it initially seemed to be. It’s interesting to note, in that case, that Borderlands 1 Remastered offers a redesigned version of that final fight, which could lead to the Destroyer’s reappearance in the new game. The first question is less clear-cut, but I’ve uncovered a fan theory on Reddit that I quite like. The first vault hunter could have become the Destroyer after stumbling across the unimaginable power mentioned in the legends of the vault. The Destroyer is obviously an incredibly powerful creature, so while there’s nothing concrete, I’m content for this to be my head-canon for the next few months. All this is just speculation, of course, and we’re not going to find out for sure until the Borderlands 3 release date on September 13. That said, Gearbox has already made it clear that it enjoys a good easter egg – the Borderlands 3 Mask of Mayhem trailer also featured a morse code message telling players to ‘count the sirens’, so eagle-eyed fans are sure to be looking out for more hidden messages over the next few months.